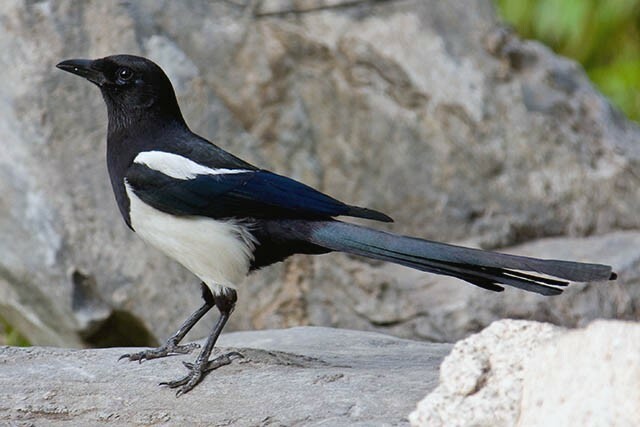 With the recent publishing of a mitochondrial DNA analysis of all accepted forms of magpie Pica, IOC taxonomy has accepted a total of seven species in the genus. The North American species – Black-billed P hudsonia and Yellow-billed Magpies P nuttalli – have been listed as full species for a long time, but now Eurasian Magpie P pica has lost four former subspecies to full taxon status. Eurasian will continue to describe those magpies found across Eurasia from Iberia to Kamchatka, but four satellite forms are now considered to be discrete entities: Maghreb Magpie P mauritanica (from north-west Africa), Asir Magpie P asirensis (from south-west Saudi Arabia), Black-rumped Magpie P bottanensis (from west Bhutan to west central China) and Oriental Magpie P serica (found from Myanmar across to Taiwan, which includes two subspecies: serica and anderssoni). All are additionally supported by both morphological and vocal differences. Maghreb Magpie, Morocco (Richard Smith). Eurasian Magpies is now considered to contain six subspecies: the wide-ranging nominate form from Britain across to Asia Minor, fennorum from northern Fennoscandia and north-west Russia, melanotus from Iberia, the central Asian bactriana, plus leucoptera from south-east Russia and north-west China and camtschatica from north-eastern Siberia. Differences between these forms are less obvious and to some degree clinal. The BirdGuides website has now been fully updated to reflect the taxonomic changes made in the latest IOC update (v 8.2), which includes the magpie split and major revisions of the cuckooshrikes (Campephagidae) and Phylloscopus warblers, as well as other amendments. Visit our Species Guide to search for new taxa. Black-rumped Magpie, China (Nigel Forrow).